· For safe lifting and transporting of steel(oil)drums. · With automatic locking mechanism. · The TDC steel drum clamps can be used single or per pair as well. 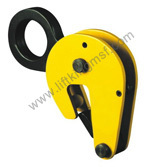 · This clamp is extremely light weight and very quick and easy to use.